The twenty-first century has brought new attention to amateur creativity and the theatre is no exception with long-standing amateur theatre companies joined by forms of creative participation often described as ‘non-professional’, voluntary, vernacular and everyday. In line with broader cultural movements towards a repositioning of the amateur in contemporary culture, a number of professional performing arts organizations have begun collaborating with amateur performers in order to establish deeper connections within their regions while simultaneously attracting new audiences. Pericles amateur company at the RSC (2012). Courtesy of the company. In this study, I analyze the impact of the RSC’s Open Stages initiative. I consider the RSC’s involvement in the amateur theatre scene from 2011-2016 and question the process of creative collaboration between amateur and professional theatre-makers throughout the programme. By drawing on rehearsal and performance observations as well as a series of semi-structured interviews with the amateurs and professionals at the heart of Open Stages, my research inquires into how participation in Open Stages did or did not shape the way the amateurs of Open Stages rehearse, perform, and conceptualize their own theatre practice. Additionally, my project investigates how we are to interpret the substance of this so-called ‘RSC “DNA”’. It asks what such a genetic code might be built from and, what are the transmutations taking place in any attempt to transplant it into the context of local amateur productions. Llanymech Amateur Dramatics Society rehearses Twelfth Night (2016). Courtesy of the company. Open Stages was conceived by former RSC artistic director Michael Boyd in collaboration with the company’s director of events and exhibitions, Geraldine Collinge, and RSC director of education Jacqueline O’Hanlon. Boyd recalls that, in his previous posts as artistic director at the Belgrade Theatre in Coventry, the Crucible in Sheffield, and the Tron Theatre in Glasgow, there were clear pathways to creating meaningful connections between the theatre’s work and the community at large. As head of the RSC, however, Boyd faced a new challenge in his efforts to generate local engagement, now on a national scale.3 For Boyd, connecting with the UK’s extensive network of amateur theatre-makers presented an answer to the most important question he faced as artistic director of one of the UK’s leading arts organizations: how can a national theatre like the RSC maintain local relevance to audiences all around the country? The answer to this question has since become known as Open Stages. It began in 2009 when 65 delegates from voluntary arts organizations were invited to Stratford-Upon-Avon to discuss the possibility of including amateur theatre-makers as participants in the 2012 World Shakespeare Festival, an event staged in connection to the London 2012 Cultural Olympiad. Following this initial inquiry, Open Stages was subsequently developed as a stand-alone, long-term project funded by the Esmée Fairbairn Foundation and designed by producer Ian Wainwright in consultation with representatives from a number of national amateur theatre organizations. In 2010, the RSC released a nationwide call for applications from amateur theatre-makers, inviting companies to pitch their Shakespeare or Shakespeare-inspired productions to the RSC for consideration. 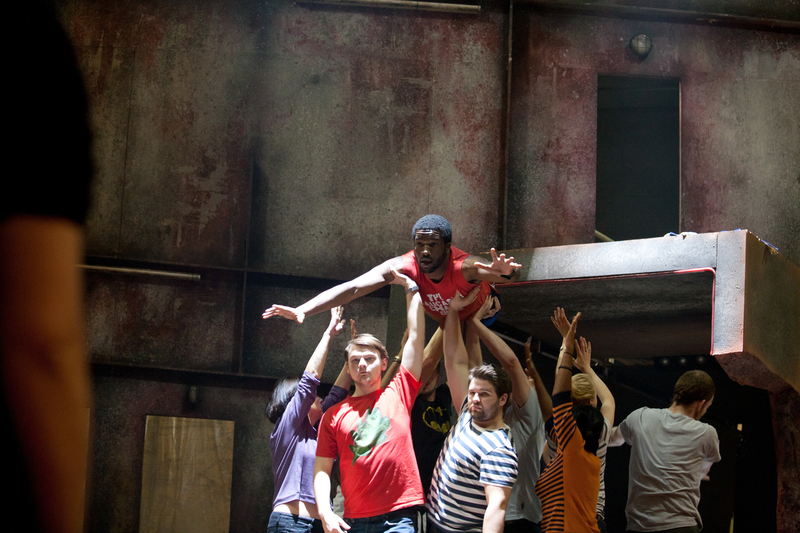 Of the initial applicants, 263 groups were accepted and invited to send delegates from their companies to a series of free ‘skills exchanges’ hosted by the RSC and their regional partner theatres. At these weekend-long workshops, participants attended classes in acting, movement, and voice as well as stage combat, text, and design. The sessions were taught by local theatre professionals as well as a core team of artists from the RSC. All Open Stages companies were invited to use the RSC Open Stages logo in their press materials and select companies were chosen to perform at a regional and then a national showcase. The RSC’s amateur partners have a wide range of training and experience. 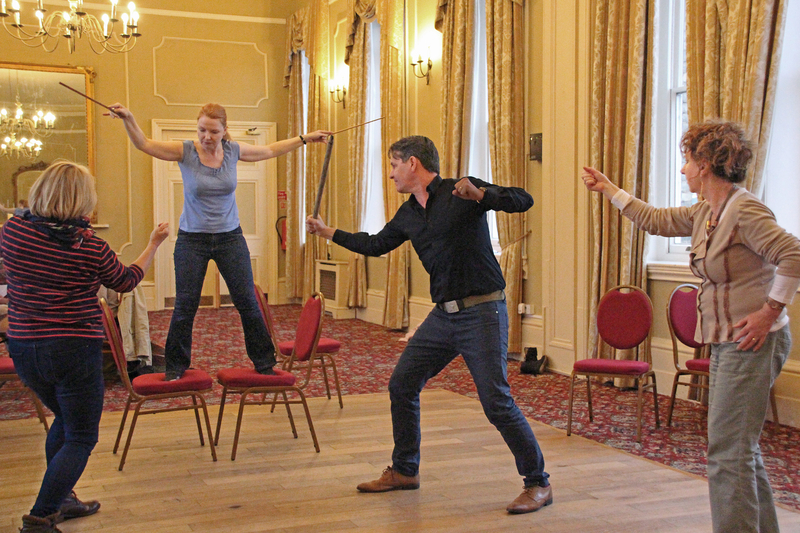 For many of the programme’s participants, the Open Stages skills exchanges constituted their first encounter with the kind of physical, vocal, and performance techniques commonly taught in professional theatre training programmes. Meanwhile, other participants already had significant experience in formal theatre training before their involvement with the RSC either in college, university, or through training workshops offered by professional theatre practitioners. Keeping their diverse histories of training and experience in mind, I asked the amateurs of Open Stages to recall their experiences at the RSC skills exchanges. I inquired into whether there were specific classes or exercises that participants found to be especially effective, and questioned how the actors and directors in attendance managed to integrate these experiences into their subsequent production processes. Responses to this line of questioning were unsurprisingly varied but, there were certain patterns of note that offer important insight into how the legacy of Open Stages is playing out in amateur rehearsal rooms around the country. While most participants found the physical and vocal exercises taught in the skills exchanges to be of great interest, some found it a challenge to integrate them into their creative processes given their limited rehearsal time. Meanwhile, other respondents found that creating an open space for discovery in their rehearsal rooms actually conserved time in that it facilitated a deeper and more meaningful connection between an actor and the text. Despite these differences in reception, my research suggests that the majority of amateur directors involved in Open Stages continued to seek out ways of adjusting and amending the exercises taught at the skills exchanges in order to effectively incorporate them into their rehearsal processes. Notably, there was one experience, one reflection that almost every single participant included in this study appears to have shared and that is that participation in Open Stages offered amateur theatre-makers an increased sense of confidence. More than the skills exchanges and more than the individual exercises taught, the amateurs of Open Stages claim it was their association with the RSC that offered new affirmation and validation to the work many of them had been engaged in for years if not decades. This new-found confidence was derived, in part, from a rise in competency. The skills development promoted by Open Stages offered participants motivation and resources with which to improve and expand their own creative practices. My research suggests, however, that for the vast majority, the confidence they gained was derived not only from the skills exchanges and the practical approaches to production shared but partially, and perhaps primarily, from the fact of their formal association with the RSC. In other words, it was recognition from ‘one of the most prestigious companies in the world’4 that invited many of the programme’s amateur participants to take a leap of faith into the creative unknown. These findings point to the potency of what Michael Boyd has described as the ‘straightforward redistribution of cultural wealth’ facilitated by Open Stages.5 Boyd’s formulation highlights some of the intricacies of the ideologies and cultural assumptions at play in Open Stages although it also raises questions about whether the RSC’s cultural wealth was in fact redistributed or if it was rather bestowed upon the company’s amateur participants. That is to say that, because our society has come to a collective consensus that what the RSC does is of value to our culture, the organization was able to, in a sense, reallocate some of that cultural value by sharing it with Open Stages amateur artists. In this way, the RSC’s involvement with amateur companies provided affirmation that the time, the labour, and the dedication they commit to their productions is of value to our culture. To many of the programme’s amateur participants, the chance to use the RSC brand and the Open Stages logo in their promotional materials represented a vote of confidence from an institution widely regarded as a national treasure. 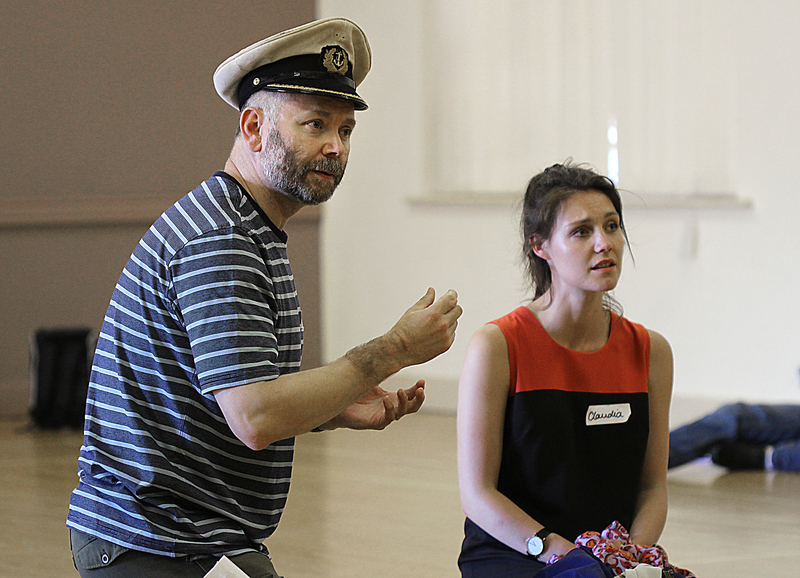 Shakespeare at the George rehearses The Tempest in Huntingdon (2016). Photographer: Antonia Brown. As my research suggests, the stereotype of amateur theatre-makers as ‘pensioners with too much eyeliner performing plays by Francis Durbridge in draughty church halls’ haunts the creative sector and sometimes hinders artists’ ability to take pride in their work.7 Of course anyone engaged in the practice knows that the diversity of skill and ability in amateur theatre is just as vast as that in professional theatre but, nonetheless, the cultural stigma around ‘am-dram’ as a leisure activity can prevent some amateur theatre-makers from sharing their commitment and enthusiasm for their work with people outside of the practice. The RSC, conversely, is widely accepted to be a national treasure, a reputation corroborated by the fact that the company receives one of the highest public subsidies of any arts organization in the country.8 As Alan Sinfield writes, the RSC’s substantial public subsidy, ‘witnesses, of course, to the ideological power of established institutions (the RSC and Shakespeare) in England’.9 The ‘ideological power’ Sinfield refers to plays an important part in the transmissions taking place between professionals and amateurs in Open Stages. In his analysis of the cultural mythology surrounding the development of the RSC throughout the latter half of the twentieth century Sinfield argues that our conception of the RSC in contemporary culture, ‘intersects fundamentally with our ways of thinking about plays and about ‘the arts’ and political change within welfare capitalism’.10 In other words, our widespread acceptance of the RSC as a national resource is derived not only from the quality of the work the company produces but also from its elevated standing in our society as an institution built to show ourselves to ourselves as a culture with a consistent history of world-class art and innovation coupled with established traditions and historical relevance. The performance of Shakespeare by amateurs is also a long-standing tradition in the UK and one that has shaped our perceptions of art, theatre, and the playwright for centuries. And yet, as Michael Dobson observes in his study Shakespeare and Amateur Performance: A Cultural History, ‘the amateur performance of Shakespeare continues to inspire embarrassment, anxiety, and derision’ even today.11 By lending their name, their accreditation, and some small part of their reputation to amateur companies across the country, the RSC has led an important step change in the way the value of amateur dramatics is perceived in contemporary culture. In doing so, the company has offered new credibility to the thousands of amateur artists who participated in the programme and has thereby created a space for participants to take increased pride in their work. This sense of pride, or confidence, the knowledge that one’s work is of value, is the primary transmission that the programme facilitated from the RSC professional to the Open Stages amateurs and the one that has had greatest impact on the creative practices of everyone involved. Through their continued collaboration with amateur theatre practitioners, the RSC has initiated an on-going process of knowledge exchange. Their involvement with the RSC, offered Open Stages amateurs new access to an alternative body of knowledge developed and maintained by professional theatre practitioners. This body of knowledge includes exercises designed to promote skills development and practical approaches to rehearsal and production. For their part, the RSC and the individual professionals employed by Open Stages gained new insight into the vivacity of performance outside the strictures of the industry. These are among the most prevalent elements of what I argue are the two-way transmissions that took place between amateurs and professional in the context of Open Stages. By sharing their space, their resources, and their approaches to performance practice with the amateurs of Open Stages, the RSC opened a door to ongoing collaborations between amateurs and professionals. Of course it is up to the individuals on either side of that door to choose how best to proceed. Nonetheless, my research indicates that it was, in many ways, the simple act of having it opened in the first place that has had the greatest impact on the amateur theatre-makers of Open Stages. A Midsummer Night’s Dream at Rugby Theatre (2014). Photographer: Martin Pulley. Dr Molly Flynn is a postdoctoral research assistant on the AHRC-funded project For Love or Money? Collaboration between amateur and professional theatre based in the Department of Drama, Theatre, and Dance at Royal Holloway, University of London. Before joining the project in 2016, Molly completed her PhD at the University of Cambridge on the topic of documentary theatre in twenty-first century Russia.